OTTAWA — The Ottawa Senators defeated the Detroit Red Wings 3-2 in a shootout at Canadian Tire Centre on Saturday, swweping a homestand for their first three-game winning streak since November. The Senators (28-26-6) trailed 2-1 with four minutes left in the third period but tied the game at 16:09 on defenseman Dion Phaneuf‘s first goal with Ottawa. Kyle Turris scored the only goal of the shootout for the Senators, who go on the road for three games in Western Canada starting Tuesday at the Edmonton Oilers. The Senators are four points out of the second wild card into the Stanley Cup Playoffs from the Eastern Conference. The Red Wings (29-20-10) have lost three in a row and five in a row on the road. Andreas Athanasiou and Brad Richards scored, taking advantage of mistakes by Senators captain Erik Karlsson, and Petr Mrazek made 25 saves. 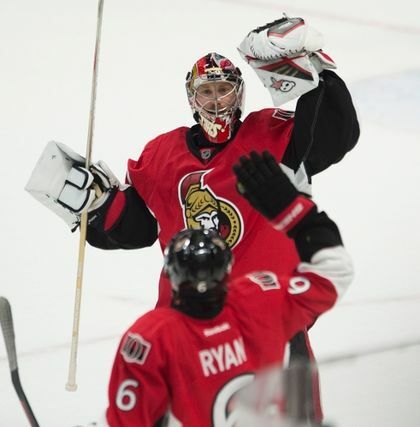 Zack Smith equaled his NHL high in goals with his 14th of the season, and Craig Anderson made 29 saves for Ottawa. Karlsson’s pass into the slot in the Ottawa zone led to the goal by Athanasiou at 10:46 of the second period. Richards was credited with a goal at 17:52 when Karlsson deflected his pass behind Anderson. “It was a tough period for No. 65 of the Ottawa Senators, but it was a great team effort and I don’t think it fazed us at all,” Karlsson said, referring to himself. “I didn’t think about it at the time. I thought I was playing a good game, and those things happen. Karlsson’s tough second period started when he spun after winning a battle along the end boards and passed into the slot when he heard somebody call for the puck. Athanasiou stepped in and scored his second of the season on a slap shot. Smith tied the game 1-1 at 11:46 when he barged through the slot and redirected a pass by Jean-Gabriel Pageau behind Mrazek. That came after Red Wings defenseman Brendan Smith turned over the puck when his stick broke. The Red Wings went ahead 2-1 when, playing 4-on-4, Karlsson extended his stick to stop a pass by Richards intended for Mike Green at the back door and deflected the puck between Anderson’s pads. Phaneuf tied it 2-2 when his shot from the point found its way through a crowd in front. The defenseman, acquired from the Toronto Maple Leafs in a nine-player trade Feb. 9, was given an ovation by Senators fans. “To be received like that, after scoring, it’s something that I will never forget as a player,” Phaneuf said. “I saw it, it was a special moment for me. Red Wings coach Jeff Blashill said he was encouraged by a better defensive effort. Asked if he thought the Red Wings deserved to win, he said, “I don’t know about ‘deserved.’ I thought in the end it was a fairly even game. They played hard too. I thought we were in a position to get the second [point] and we didn’t. That’s frustrating, but we can’t let that get to us. Detroit forward Justin Abdelkader said the Red Wings’ problems on the road can be fixed by emphasizing their skating game. The Red Wings played without leading goal-scorer Dylan Larkin, who was sick. Forward Teemu Pulkkinen, who was scratched for the past eight games, replaced him. Blashill said he expects Larkin to play Sunday against the Rangers. Mrazek was hit by a hard shot on the right side of his neck from Senators defenseman Patrick Wiercioch at 4:05 of the first period but stayed in the game. Mrazek said he was not injured.